Last night I attended my first vision board party. 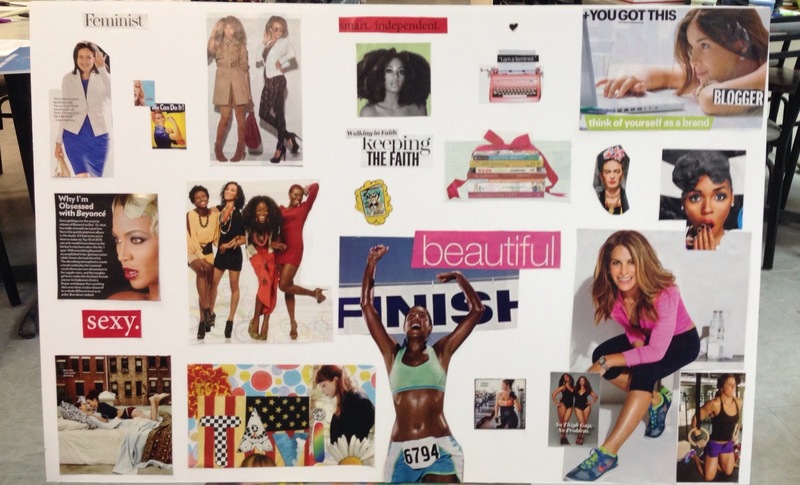 This wasn't my first time creating a vision board, but it was my first time doing so with a group. It was much more fun working on this project with my girlfriends at a local crafts shop than alone in my living room. Decide on the purpose of your board. Will your board illustrate your goals for the year? Will you fill it with images that represent the items on your bucket list? Will your board represent all the places to which you wish to travel? Or will your board simply be filled with images and words that make you happy? It's your board so you decide what you want from it. I decided that my board would represent my list of 33 things I want to do while I'm 33. Make a list and check it twice. Draft a list of the goals or destinations that you'll seek to represent with your board. Make a list of things that make you happy. Or make a list of themes. To guide the creation of my board, I used my list of 33 things and a list of themes -- things that are important to me and that define who I am such as faith, feminism, fitness, writing and blogging, my marriage, my friendships, empowering women and girls, etc. Browse your favorite magazines. Flip throughout several magazines to search for images. Inevitably, while looking for images you will come across articles you want to read. Just tear out these articles and put them in a folder. Read them later, not while you're searching for pictures. Otherwise, this process will take hours or even days to complete. Cut and paste. Once you have your images, it's time to create your board. I'm a bit of a neat freak when it comes to vision boards. Before pasting down anything, I neatly arrange my images on my board until everything is just right. Then I take a picture of the board (I know, I need help.). Finally, I paste the images in place. This may not be your style. You may want a fun collage-like board with diagonal overlapping images. The key is for your board to represent you. My board certainly screams Javacia! On it you'll find images of women who inspire me such as Lean In author Sheryl Sandberg, Queen Beyonce, musicians Solange and Janelle Monae, artist Frida Kahlo and fitness guru Jillian Michaels. I have images representing my fitness goals and my writing goals, and I even included an image to remind me to spend more quality time with my husband. I have a picture of 17-year-old Tavi Gevinson not just because she's editor of Rookie Mag and completely awesome, but also as a reminder of all the young feminists I want to help and inspire. Before you start making your board you'll probably have an idea (a vision) of how you want it to look. Chances are, though, once you start putting it together things will change and it won't turn out exactly how you imagined. That's OK. After all, life is like that, isn't it? Your path probably looks different than the one you thought you'd be traveling. But remember to enjoy the journey and don't forget to delight in the detours. OH! And I also have SEE JANE WRITE on MY board too. I saw that and it made me VERY happy. Thanks for being such a great supporter of the group.